When it comes to decorating your new Edgewater apartment, finding the right art can be a challenge. Blank walls are boring, but you can see a painting or wall hanging that really catches your eye just to find that it doesn't fit well with your decor or wall layout. These tips can get your apartment looking like it's truly your space in no time. 1. If the walls look busy, less is more. Colorful wallpaper and paint jobs, or natural textures like exposed brick, look great on their own, and adding artwork to the walls can make them look too loud. Pick just one piece that complements the color scheme. 2. There's more to art than paintings and prints. Wood carvings, metal or cloth hangings, found objects — the possibilities are endless for the kind of art you can use to decorate your walls. Different textures can liven up a room that feels boxed in by plain white walls. 3. Use a big wall instead of an entire room. Depending on the floor plan you have, a spacious room with one huge wall should be the focal point for your taste in art. 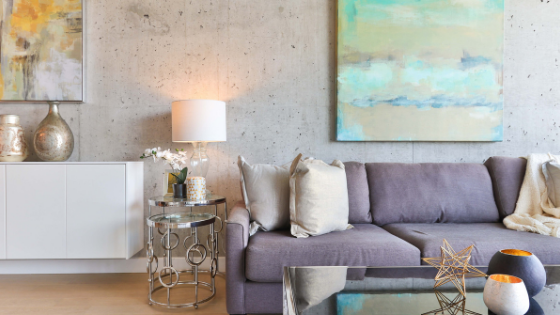 Group paintings and other art fairly close together over a central piece of furniture like the TV stand or couch rather than scattering artwork around several walls in the same room. This can result in a cluttered appearance that can make the apartment feel smaller. Work with the largest wall in the apartment or room to create an aesthetically pleasing focal point. 4. Stack art vertically in unusual dimensions and small spaces. Look for smaller prints and wall hangings and line them up in a vertical fashion if you're renting a studio or other small space. This helps elongate the walls and gives the illusion of more space in addition to creating an uncluttered focal point for your artwork of choice. Just a hop and skip away from Manhattan, Infinity Edgewater is a place you'll want to call home, whether you've fallen in love with our high ceilings that can showcase lots of art or you want to take advantage of our short-term leases. Contact us today to speak to a leasing agent.